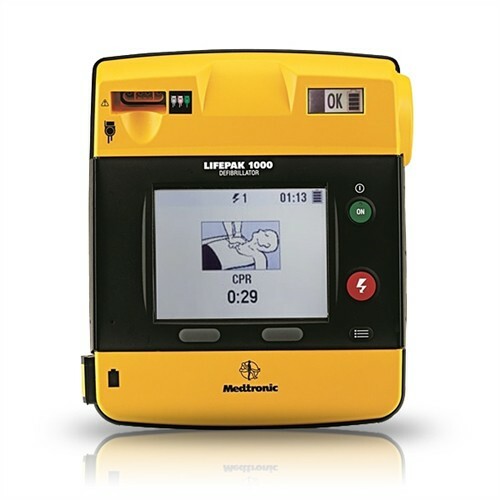 LIFEPAK with Graphical Display - SHIPS FREE! The LIFEPAK 1000 by Physio-Control is an automatic external defibrillator that has been rigorously tested and proven to be durable and reliable. This long-lasting defibrillator can be stored in a vehicle without any risk of damaging the device. The LIFEPAK 1000 has been designed to administer shocks at escalating levels, should it be deemed necessary. The device will initially administer shocks beginning at 200 joules and the shocks will increase in power up to an industry-leading 360 joules. Studies have shown that shocks at the 360-joule level will be more effective for people who do not respond to 200-joule level shocks. The LIFEPAK 1000 has cprMAX technology that makes it possible for the rescuer to continue CPR while the device is charging. The CPR countdown timer lets the rescuer know how long each round of CPR should be. Throughout the entire process the AED will instruct the rescuer using a clear voice and graphic prompts that are easy for anyone to understand and follow. The CPR technology can be programmed to ensure that it adheres to a team's CPR protocol. The electrodes included with the LIFEPAK 1000 are compatible with all other types of LIFEPAK AEDs.